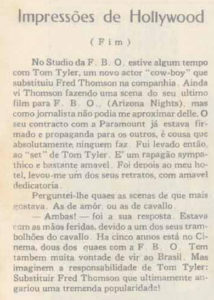 While the textual information is in fact general and can be found in English language sources, the photo of Tom and his director is rare for that time period. 1928 is a significant year for Tom, not just as an actor, but also in his career as a heavyweight weightlifting champion, when he won the AAU championship. As can be seen in the photo, Tom has a magnificent athletic build, in addition to his infectious smile. It is important to search as many online newspaper sources as possible, regardless of what language the newspaper is in. 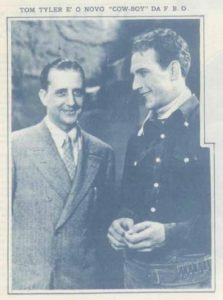 Articles can always be translated, and the title of the newspaper itself, such as Heraldo de Madrid, is an intriguing original source to list in any film written article.